The movie has almost nothing to do with the book(s). There is a detective (like in the books) who doesn't trust robots (like in the books) who ends up working with one (like in the books) and ends up understanding that particular robot (like in the books). There are the 3 laws (like in the books) and there is the eventual discovery of the "flaw" in the 3 laws (like in the books). But this plot was never in the books.. nowhere.. never.. nada.. uh uh... This was created from whole cloth, and fails to use just about anything from the books, other than the basics listed above. 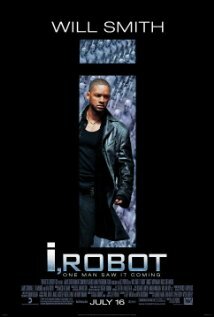 Still and all, an entertaining film, and an intro to the 3 laws of robotics to people who have never read Asimov.